Discover your options for treating Spine tumors with CyberKnife. The CyberKnife® Robotic Radiosurgery system offered by the Pasadena CyberKnife Center for spinal cancer treatment in Los Angeles can treat tumors anywhere in the body without surgery and non-invasively, including the spine. The procedure was approved by the U.S. Food and Drug Administration in 2001 and has proved to be the most precise, effective targeted treatment for cancerous and non-cancerous spinal tumors. There are several reasons why CyberKnife is the preferred treatment option for those suffering from spinal tumors in Los Angeles. CyberKnife spine cancer treatment is the evolution of radiation therapy technology and is setting the standard for the treatment of spinal tumors. CyberKnife provides treatment where other options may be impractical or inadequate. The location of spinal tumors can be near the lungs or neck where there is constant patient or bodily movement. CyberKnife has pinpoint accuracy and the ability to target tumors from virtually any angle, with its unique robotic design, and exclusive image guidance and tumor-tracking software. Other conventional therapies are more limited and may be unable to treat some spinal tumors that may be difficult to target or are inaccessible with older treatment technology. Patients who choose CyberKnife are usually fitted with a comfortable body cradle and placed on the treatment couch. Digital imaging guidance systems help to locate the spinal tumor and the robotic arm delivering the radiation automatically adjusts to the location and movement of the tumor, which can then be targeted from multiple angles. CyberKnife represents the most advanced technology in spine cancer treatment. CyberKnife treats with precision and accuracy, reduces side effects, and treatments are delivered in five sessions or less. CyberKnife is the only treatment that tracks the real-time movement of the tumor and delivers radiation only to the exact location of the tumor. Other standard treatment options are unable to track and automatically correct for tumor movement and instead treat the tumor and the entire surrounding areas, potentially damaging healthy tissues around the tumor — leading to more side effects. Because CyberKnife accurately targets only the tumor, it can use a higher dose of radiation and effectively treat the tumor in one to five sessions, unlike conventional radiotherapy that can take five to eight weeks. This decrease in damage to healthy tissue and fewer treatment sessions means CyberKnife patients are free from the significant side effects associated with conventional radiation therapy, and are able to recover quicker and easier. Whether you’ve just discovered that you have a spinal tumor or you’ve been in treatment for a long time, your oncologist might recommend CyberKnife treatment alone or in conjunction with other treatments. Start by contacting our center to schedule a consultation with one of our oncologists about whether CyberKnife could be right for you. Then, contact us at our Los Angeles treatment center to make an appointment. The CyberKnife® Robotic Radiosurgery System was cleared by the U.S. Food and Drug Administration in 2001 to treat tumors anywhere in the body, including the spine. Despite its name, the CyberKnife System is not a surgical procedure. In fact, there is no cutting, anesthesia or needles involved. Instead, the CyberKnife System delivers high doses of pin-point, sub-millimeter radiation directly to spine tumors, sparing healthy tissues around the tumor. The CyberKnife System offers patients who cannot undergo spine cancer surgery, those who refuse surgery, or for recurrent tumors that have already had radiation, a minimally invasive alternative treatment for spine cancer. Pasadena CyberKnife spine cancer treatments are performed on an outpatient basis over a period of one to five days, requiring no overnight hospital stays. Most patients experience minimal to no side effects with a quick recovery time. How does Cyberknife System Treat Spinal Tumors? How Does the CyberKnife System Treat Spinal Tumors? The CyberKnife Dedicated Robotic Radiosurgery System offers patients the latest and most advanced option for spine cancer treatment. Unlike regular conventional radiation therapy, during which low doses of radiation are delivered over 7 to 10 weeks, the CyberKnife System can treat a tumor in 1 to 5 days by delivering a high dose of radiation with sub-millimeter accuracy, sparing healthy tissue. The Cyberknife accuracy matches that of surgery, with surgical outcomes, yet without cutting, needles or anesthesia, hence Radiosurgery. Spine tumors present a treatment challenge because they move as the patient breathes. Conventional radiation therapy cannot account for this movement, so surrounding healthy tissue is damaged by the radiation. The CyberKnife System is able to achieve surgical accuracy, – within a millimeter – completely non-invasively – without the use of body frames or implanted fiducial markers. It can pinpoint a tumor’s exact location in real time throughout treatment. In addition, the unique design of the Cyberknife robot can approach a tumor from virtually any angle, something that conventional, gantry designed technologies, cannot do. The CyberKnife System allows the patient to breathe normally while on the treatment table, enabling the doctor to zero in on the moving tumor and focus hundreds of radiation beams from different angles, all of which intersect at the tumor. Using this method, the CyberKnife System is able to deliver a high dose of radiation to the tumor while avoiding damage to the surrounding sensitive spinal cord tissue and other critical structures. As a result, radiation is delivered more accurately and treatments can be performed in a shorter period of time (1 to 5 days vs 25 to 45 days on other systems). Treatment planning is then performed by a medical physicist in conjunction with the treatment team. The patient will not need to be present at this time. During treatment planning, all CT, MRI and other scan data will be downloaded into the CyberKnife System’s treatment planning software to develop a customized treatment plan. The medical team will determine the size of the area being targeted by radiation and the dosage, as well as identifying critical structures – such as the spine or vital organs – where radiation should be minimized. The CyberKnife System calculates the optimal radiation delivery plan to treat the tumor. The treatment plan will take full advantage of the CyberKnife System’s maneuverability, allowing for extremely accurate delivery of radiation. When treatment begins, the CyberKnife System will use X-rays to place the patient into the proper position and pinpoint the location of the patient’s tumor. The CyberKnife System’s computer-controlled robot will move the radiation source to multiple locations around the patient as they lie still on the table. Throughout the treatment, more digital images of the spine will be captured by the image guidance system in order to verify the tumor location. If the patient moves slightly, the change is detected by the imaging system, which automatically adjusts the robotic arm before delivering the radiation. By adjusting in this manner, the radiation beam can accurately target the tumor throughout the entire treatment process and minimize damage to healthy tissue. There are generally only minimal side effects from CyberKnife treatments. Occasionally patients report mild, temporary nausea, particularly if the lower abdomen is undergoing treatment. Prior to treatment, the doctor will discuss with the patient all possible side effects they may experience. The doctor also may prescribe medication designed to control any side effects should they occur. After completing the CyberKnife treatment, patients should schedule and attend all follow-up appointments. Patients must keep in mind that the tumor will not suddenly disappear. In fact it could take several months, or longer, to determine the effectiveness of the CyberKnife treatment. Response to treatment varies from patient to patient. Clinical experience has shown that most patients respond very well to CyberKnife treatments. By routinely evaluating the symptoms and undergoing post-operative MRIs, the doctor can chart the patient’s post-treatment progress. What is Cancer of the Spine? Spine cancer is an abnormal growth of cells in or around the spinal cord resulting in a tumor. If the abnormal cells originated from cells in the tissues of the spine, the resulting collection of cells is called a primary spine tumor. If the abnormal cells originated in another part of the body, such as the lung or breast, and were carried to the spine by the blood or other bodily fluid, then it is considered a metastatic spine tumor. More than 18,000 cases of primary spine tumors and more than 162,000 spine metastases are diagnosed in United States each year1.Spinal metastases can occur in up to 40 percent of cancer patients2. Primary spine tumors are relatively rare types of tumors that originate in or around the spine itself. They can either be benign (non-cancerous) or malignant (cancerous). Metastatic tumors can spread to the spine through the bloodstream, along nerves or within the fluid that surrounds the spinal cord and brain. These cells most commonly originate from tumors within the lung, breast, skin and colon, and are deposited in the spine, eventually growing into a tumor or tumors3. 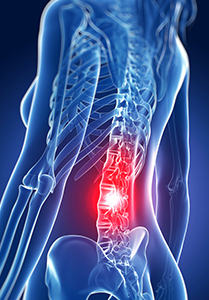 What are Spine Cancer Symptoms and Detection? How is Cancer of the Spine Detected? *Patients often experience pain that either is in the spine itself or radiates from the nerves in the spine. Magnetic resonance imaging (MRI) and Computed Tomography (CT) scans. 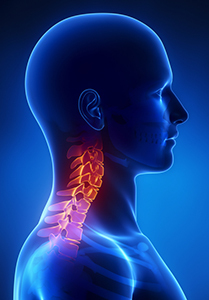 Once a spine tumor has been diagnosed, more tests may be needed to identify the specific type of tumor and determine the proper treatment for the patient. For more information on CyberKnife’s ability to treat Spine Tumors, check out our Case Studies.